Grains for Your Brain is sponsoring this post on behalf of the Grain Foods Foundation, a joint venture of members for the baking and milling industries and allied suppliers. The site is full of recipes and packed with information about all varieties of whole grains. 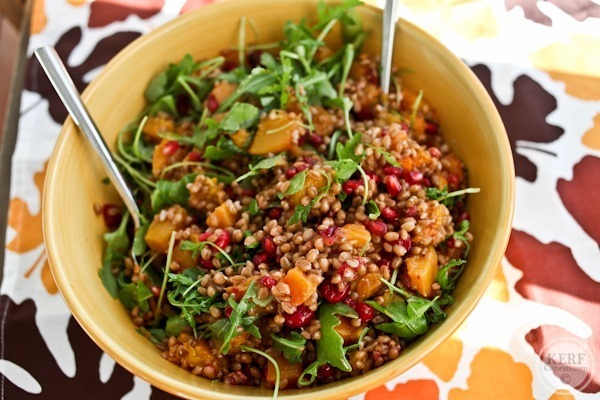 Wheatberries form the backbone of this hearty salad. Look for them in store bulk bins as Hard Red Winter Wheat. Wheatberries are the hard, rice-like kernels of the wheat plant. They are a whole grain containing the bran, germ and endosperm, and if you mill them they turn into whole wheat flour. We buy huge bags of them for our bakery and mill them in the store daily so our whole wheat flour is as fresh as can be. I used to cook a batch to stir into oatmeal, yogurt and the like but I got out of the habit. I miss the days when I had a lot more time in the kitchen! 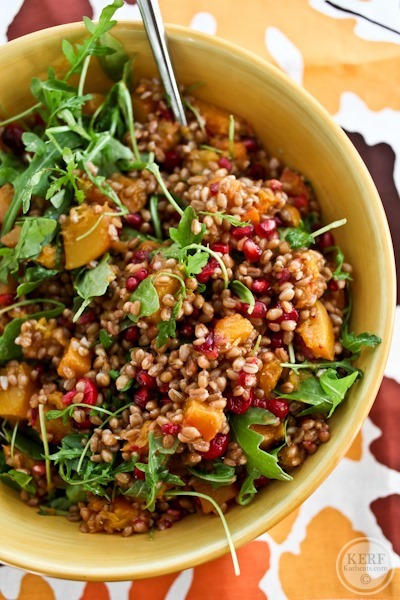 To prepare the Ultimate Fall Wheatberry Salad, you’ll first want to cook your wheatberries. There are multiple ways to transform them from hard pellets into soft, chewy grains, and I detail my quick cooking method in this post. Soaking them overnight will speed up the cooking process. The bottom line is to simmer them until they are tender much like you would cook pasta until al dente. I brought home a giant butternut squash for this recipe – about 2.5 pounds work! Toss the chopped butternut squash in seasonings: olive oil, brown sugar, cinnamon and salt. 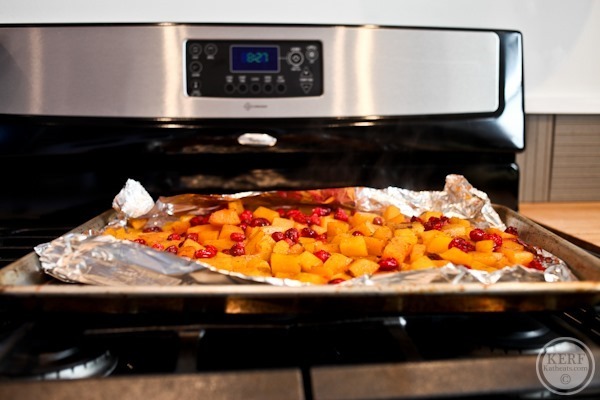 Line a pan in foil and then cover the squash to ensure trap the steam for the first 20 minutes. After 20 minutes, uncover and add the cranberries. Stir them around and put the whole pan back in the oven for another 15. 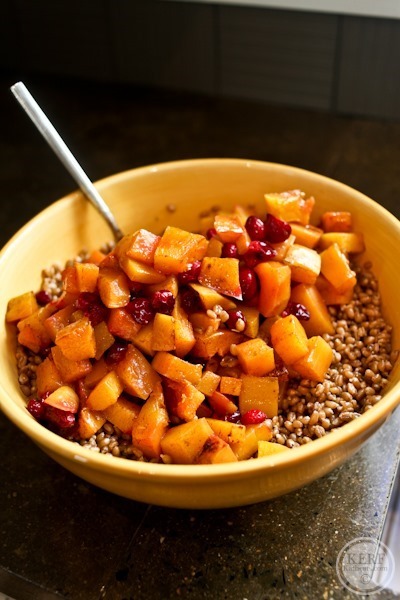 While the cranberries and squash roast, prepare your dressing and toss with the wheatberries to evenly coat. 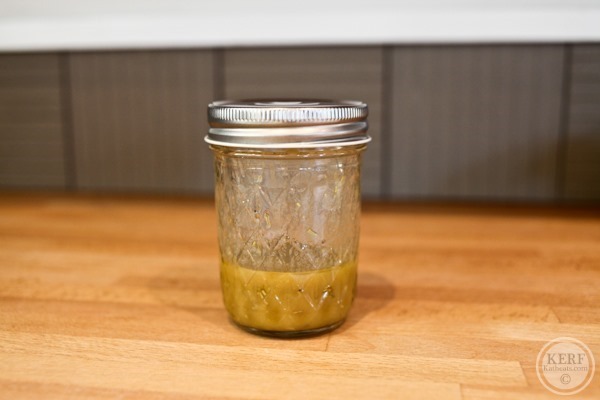 This dressing is a little bit sweet from the maple syrup, a little spiced from the Dijon mustard and a little tart from the lemon juice. I love rosemary in every salad dressing. Add a clove to garlic if you like more kick! You can serve this slightly warm immediately or allow to cool in the fridge. It should keep for a few days, so you’ll have lunches for the week or a side dish to feed a crowd! Feel free to make this recipe exactly or customize it as much as you want with sweet potatoes, walnuts, raisins, goat cheese and more. 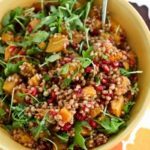 This salad combines all your favorite fall ingredients - cranberries, butternut squash and pomegranate arils - into a chewy wheatberry delight dressed in a maple Dijon vinaigrette. 1/2 teaspoon dried rosemary or fresh if you have it! Fill a large pot with water and a 1 teaspoon kosher salt and wheatberries. 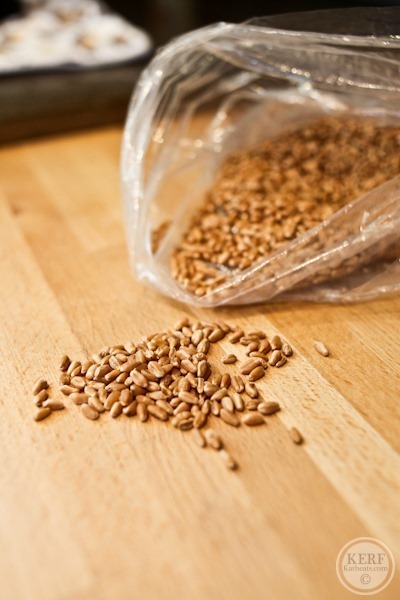 Bring to a boil, cover and reduce heat to a low simmer for 1 hour, until wheatberries are tender enough to chew. Drain and set aside. Meanwhile, preheat oven to 400*. 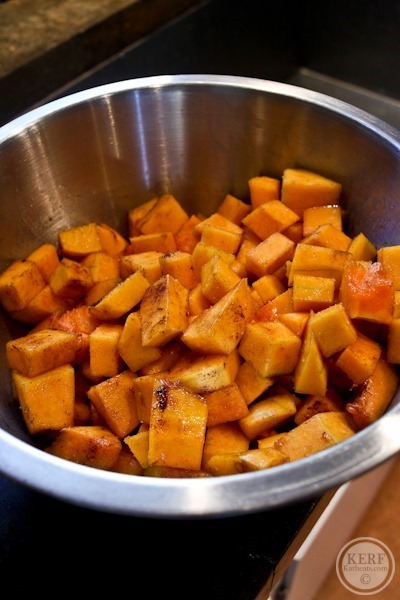 Toss cubed squash with 3 tablespoons olive oil, 2 teaspoons brown sugar, 1/2 teaspoon cinnamon and 1/2 teaspoon salt. Line a pan with foil and fill with squash. 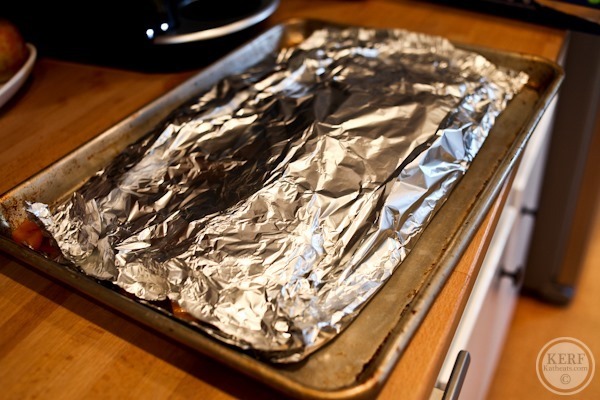 Cover with more foil and bake for 20 minutes. 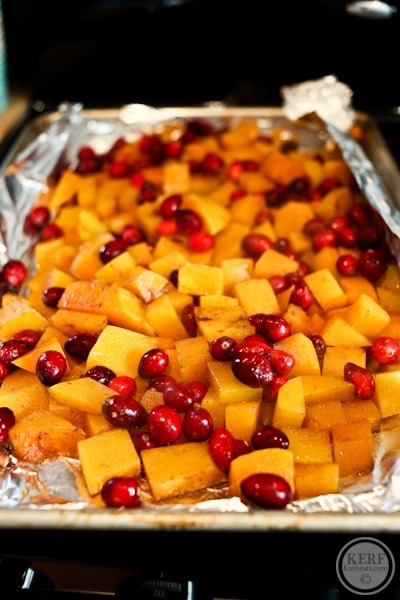 Remove squash, uncover and add 2 cups cranberries. Bake for another 15 minutes, until squash is fork-tender and berries have softened. Prepare dressing by combining all ingredients in a jar and shaking well. 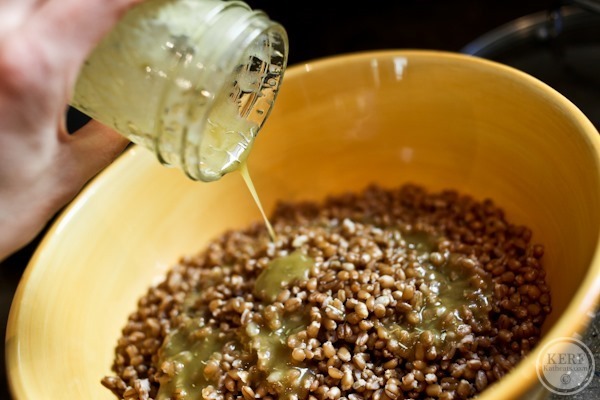 Coat wheatberries with dressing. Toss to combine. 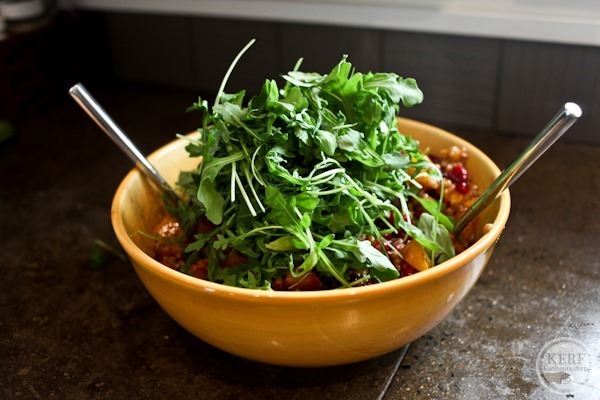 Add squash and cranberries, pom arils, and arugula and toss everything well. Serve slightly warm, room temp or chilled. This post was sponsored by the Grain Foods Foundation. I think your blog is where I first discovered wheatberries…one of my favorite food words! Gorgeous! Love pomegranates and cranberries this time of year! Hella seasonal! Looks like a great salad! I’ve always been curious about wheatberries, but never really know what they were, or how to cook them. Now that I know, it seems like a great ingredient! Looks divine! The colors are fabulous! This is the perfect Thanksgiving side dish. Next step: Convincing someone in my family to make it. It would have been great if you had included the health benefits of wheat berries. How are they nutritious? Here’s a link to the World’s Healthiest Food on whole wheat (which wheatberries are). Nutrients include vitamins and minerals, protein, fiber and phytochemicals. Mmm… This look so right up my alley! Pinned! Beautiful salad! I was on a wheatberry salad kick a couple of years ago (thanks to your blog! ), but I have forgotten about them. I love their chew!! This looks like a healthy Thanksgiving option! nothing more fall than butternut squash! yummmmm! Sounds delicious! I actually think I have some wheatberry at home (husband bought it for a beer brewing attempt, but I don’t think it was what he wanted). Anyway, I’ve had no idea what to do with it and didn’t want to throw it out. This recipe looks like a perfect way to try it. I totally hear you on missing having more time in the kitchen. Mine are now 2 and 4 months, respectively and while I feel pretty good about getting mostly balanced meals on the table with two under foot, and zero sleep, I sure do miss the days when I could putter and play in my kitchen. Love being a mom, but I find it pretty all consuming. Yum! I can’t wait to try this. Random question for the dietitian, do you know anything about the book “The Grain Brain”? I would be interested to hear your take on it. I just read a short recap of the book. I’m not planning to read any of these sensationalist anti-carb/grain books (this one, Wheat Belly, etc). It’s just like the low-carb of the 90s – the latest diet has a flurry of books published to make money. Until the unbiased (relatively) medical community comes out to strongly recommend against something, I just don’t buy it. As much supporting evidence as there probably is, there is probably another whole side refuting it with research too. I absolutely agree with you Kath!!! I’ve always wondered what wheatberries are. Thanks for the information! I do something similar with quinoa. I’ve actually never used wheatberries before but now I want to try! Thanks for sharing the recipe. It looks beautiful! I don’t know if I’ve ever really had wheatberries actually. I may have tried them at some point from a Whole Foods bar but I really want to make them on my own! This salad looks great! I tend to be bored with traditional lettuce salads that only have veggies, but any kind of grain or pseudo-grain piques my interest! Yum — this looks so good! I’ve never really eaten wheatberries before, but I’m definitely inspired to give them a go! Kath, 5 years ago YOU introduced me to wheat berries and I can honestly say my life hasn’t been the same since! For this I say THANK YOU! I love making wheat berry salads! I have a butternut squash and some cranberries just ITCHING to be added into a wheat berry salad….With goat cheese, pumpkin seeds and a touch of fig balsamic vinegar!!! This looks so gorgeous! I never thought of adding wheat berries to oatmeal–that’s an awesome idea! YUMMY!!! Healthy and beautiful! Looks like my kind of salad! I’ll be right over…this looks amazing! This salad looks amazing! Why did you cover the butternut squash with foil? Does that help it cook? Check out a company called InHarvest. I buy all of my whole grains & dried beans from them. They have the most amazing rices, beans & grains! 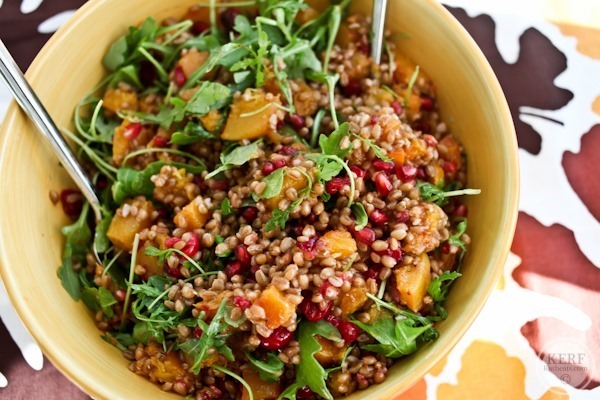 The Jewel Blend of whole wheat couscous, lentils, red quinoa is one of my favorites! Sorry! I don’t know how to make the link hot! I made this for my family…huge hit! They don’t like butternut squash but loved it in the salad. Going to try it with half sweet potato half squash next time and chop smaller. Thanks for the recipe! !